Occasionally, in Blogger Help Forum: Learn More About Blogger, we see a question from blog owners, who are accustomed to publishing static websites. How do I upload a custom sitemap, for my readers to use? How do I build a drop down, cascaded menu bar, to index the posts? The answer, for Blogger blogs, is that neither is truly useful. As you publish posts, both fancy menus, sitemaps, and numbered pages, become out of date. Any newly published page or post must be updated, with a static index. Any time you publish a new post, you have to add the post as a menu or sitemap entry - or the menu / sitemap becomes out of date. Updating the menu / sitemap, as part of publishing posts, takes time away from writing posts. The dynamic Archives gadget is better, for indexing posts, than a static LinkList gadget. 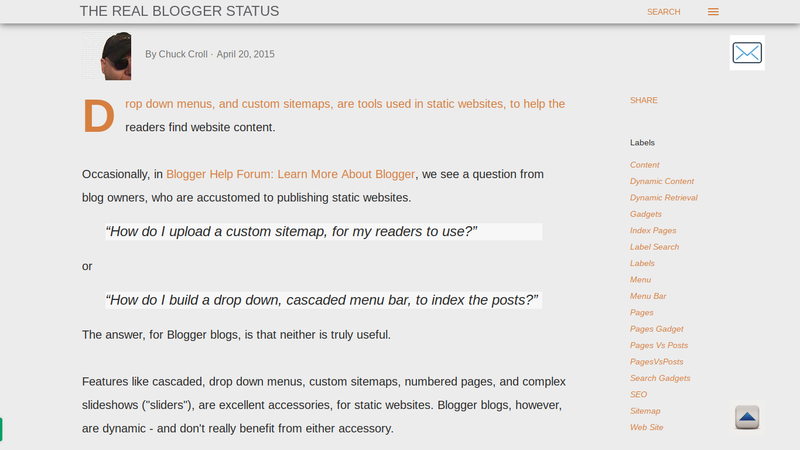 Blogger now publishes a sitemap, automatically. You only publish posts, Blogger does the rest. Blogger blogs are dynamic - and use dynamic indexes, for best results. Blogger blogs are dynamic. To tell the reader what's in the blog, we use dynamic accessories. Archive retrievals (for indexes by date). Blog searches (for indexes chosen by the readers). Label searches (for indexes chosen by the blog owner). A custom blog search is a cross between blog searches and label searches - and lets the reader choose what indexes to use, based on content already indexed. Both archive retrievals, blog searches, and label searches, reference blog content, dynamically. The different retrievals and searches offer different choices to both the owner and readers - and don't require a lot of time spent, updating gadgets as you write posts. Note the differences between the archive retrievals, blog searches, and label searches - and the differences between the direct and indexed blog search. All 4 types of search have their different advantages - and as a whole, make dynamic searches far more productive, than menus, manually produced sitemaps, and numbered pages. The main page of the blog, with the posts summarised using Jump Break, is another useful feature. The main page view complements the archive retrieval - and includes label searches, linked from any post when viewed. Archive retrievals reference posts in an alphabetic, or date, sequence. The main page display, with Jump Break properly used, provides an expanded archive index. An Archive date index gadget provides an index to the main page display, and offers your readers the ability to search your posts by post publish date. An Archive alphabetic index gadget provides an alternate index to the main page display, and helps your readers search your blog using post titles. 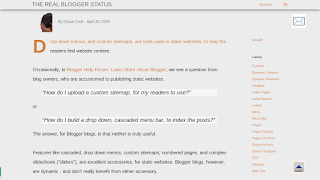 The former is maintained automatically by Blogger, as you publish posts; the latter, you maintain on your own. Both may be useful, to your readers. The Archives date index was the only blog index provided, originally. Both the blog searches, and the label search (and labels, in general), were later offered as blog features. The Archives title index is provided, by some thoughtful blog owners, for small blogs. Direct blog searches use reader chosen keywords, and current content. Direct blog searches offer the reader the most dynamic opportunity to decide what blog content to view. The reader provides the keywords for the search - and sees results, based on blog content at that time. Direct blog searches have one limitation, which may be intentional. They only search posts - not static pages, and not template content, such as accessories and gadgets. Indexed blog searches use reader chosen keywords, and cached content. Indexed blog searches offer you, the owner, the chance to decide how to display search results. The reader provides the keywords for the search - and sees results, based upon search engine cached content at that time. Indexed blog searches search all indexed blog content - optionally including static pages. Both direct and indexed searches have their advantages - and disadvantages. Your readers will appreciate the choice of the direct, and indexed, search gadgets. Neither gadget replaces the other; both have advantages and disadvantages. Label searches use owner chosen keywords, and current content. You can build custom label searches, referencing a combination of labels, in a label search URL. You define the keywords for label searches, emphasising the important features of the blog - and the reader sees results, based on blog content at that time. A label search can be based on a Label index gadget, updated automatically as you publish posts, to list all labels alphabetically. You, the owner, can structure the labels to reflect blog content and structure - and include all owner defined blog searches. Unlike some Blogger provided gadgets, a blog can have multiple Label index gadgets. You can choose which label searches to index, in each gadget. This gives you the opportunity to include different labels, in different contexts. 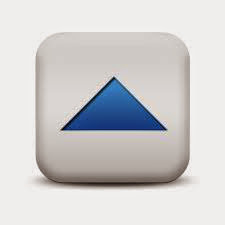 Use the Pages gadget, to include important searches and static content. You can make a custom menu bar, referencing important blog features, from the Pages gadget. Look at the menu bar above, and all of the different choices. Complementing the custom menu bar, you can have indexed blog search gadgets, direct blog search gadgets, and label search gadgets in the sidebar - and in various blog pages. As an example, look at the fixed sidebar in this post. Look above, and to the right, for "Labels". That's a dynamic feature, added as part of the "Notable" theme. Do you see "Labels", in the fixed sidebar? This post, alone, links to 18 dynamic indexes. Other posts have different and more index links. You can see various choices, in this post, at the top of the (fixed) sidebar - and in the "Topics" page. Right now, this post has 18 labels. At any time, I may add another label - and this post will have 19 or more dynamic indexes, where you may find more relevant content. This is part of the "publish now, revise later" strategy that is the center of dynamic content. Having detailed indexes, with dynamic sizes, is a much better use of screen space - and makes a simpler Pages based main index. All of these accessories, separately provided, make the blog easier to read. Each dynamic index will have different entries - and will paginate differently. Neither multi level menus, sitemaps, or slideshows, are necessary or useful. A cascaded, drop down menu bar requires complicated, custom code. Some helpers will suggest shiny code, served from their personal libraries, which may later become malicious. Some readers may block unknown code, making your blog unreadable. Sitemaps are used by the search engines, to provide structured content retrieval, relevant to the need of the search engines. Blogger provided sitemaps take into account no preferences by the blog owner, or readers - they are automatically built and updated, as new posts are published. Fancy menus and sitemaps, like carefully chosen header sizes, are useful in static websites. They are not as useful in dynamic blogs. Use properly chosen dynamic accessories - provided in such an intriguing variety. Then, spend more time publishing blog content. I sure appreciate your blog and its contents. This article saved me a lot of time as I wanted to try to use something that will not result in what i want. I really appreciate the effort you have made developing this source of information.